The above picture is a trip for smelt. We got 400 smelt. Come to Door County and go fishing with me Captain Andy Stuth. I'm a full time Fishing Guide. I'm on the water about 300 days a year. I will bring you to all my hot spots that most fisherman don't know. I will fish on your boat or I will book a boat for you and fish with you as your Captain. I work with other people for all your corporate and company outings. I take all the work out of booking. 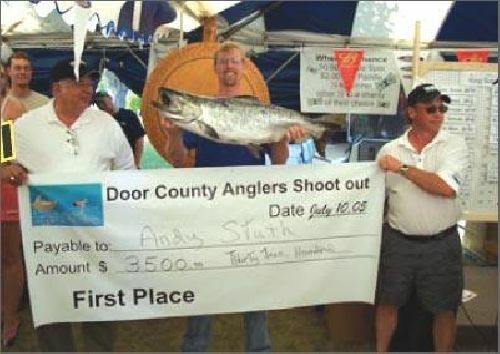 I have been fishing in Door County my entire life and won the 2005 Door County Anglers Shoot out. Check out Salmon Tournament. You want the time of your life!!! You are in the right place. Give me a call and tell me what you want to catch and I will make it happen. Catch the fish you want to catch! Whether it's: Pike, Walleye, Whitefish, Jumbo Perch, Bass, Burbot, Salmon, Brown Trout, Rainbow Trout, Lake Trout or smelt. I will bring you to my best spots. I know the waters of Door and Kewaunee county. The Lake and the Bay of Green Bay. Make your reservations early to insure dates of your choice.